About a month ago in Under God Indivisible And Joined With Apostates I reminded you that as God sends spiritual blindness upon the world, this postmodern time in which we live has headed people deeper and deeper into the shadows of darkness. What they’re falling for is the deception sweeping through Christendom that somehow it’s now become God’s “dream” for all of the various factions calling themselves Christian to unite and begin working together to make the world a better place. There’s another strain to this virus as well, which is what’s growing into a real spiritual fetish about bringing “America back to God,” as it it ever even was of God. The United States was never a covenant nation to the Lord and it doesn’t replace Israel. In my view it is not possible to get an operational handle on how to initiate corporate action toward social transformation without taking into account the seven mountains or what I like to call “molders of culture.” The seven are religion, family, business, arts & entertainment, government, education, and media. Jay W. Richards, senior fellow at the Discovery Institute, and author with James Robison of Indivisible: Restoring Faith, Family, and Freedom Before It’s Too Late, spoke alongside Barton at Christian conferences as recently as last month. Uh-oh, looks like there’s trouble in the “America’s God’s nation” camp. By the way, Richards is a Roman Catholic whom the sinfully ecumenical James Robison believes is a Christian, along with Roman Catholic priest Jonathan Morris. 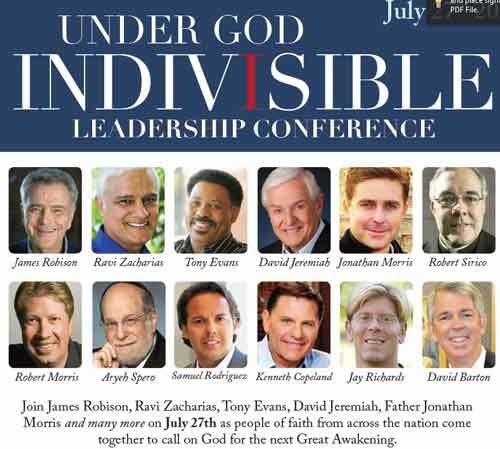 All of these spoke with Barton at the “Christian” leadership conference I mentioned above. 3. It excuses Thomas Jefferson’s practice of enslaving African-Americans. 4. The Jefferson Lies is riddled with factual distortions and falsehoods. He questions how many of his new critics have actually read his work, especially The Jefferson Lies… He says that all of his books, including his latest, are fully documented with footnotes,… A full-scale, newly published critique of Barton is coming from Professors Warren Throckmorton and Michael Coulter of Grove City College, a largely conservative Christian school in Pennsylvania. emphasizes that he and the scholars he consulted about Barton are politically conservative evangelicals or Catholics. Here I do stand in agreement with Jay Richards. May the Lord set him free from slavery to Rome’s false gospel.